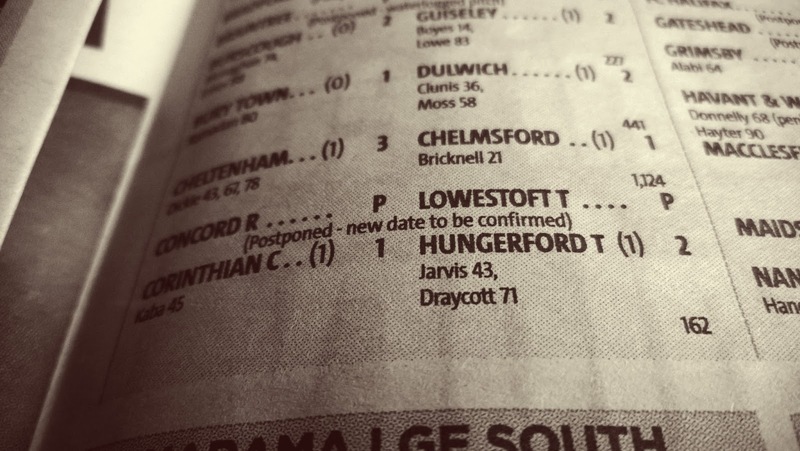 "Concord Rangers' #FATrophy game against Lowestoft on Saturday is off. Concord charged with playing an ineligible player in the last round." Immediately the mind sends you into the darkest nether regions to think what this means. Hang on, we lost to Concord in the last round? Doesn't that mean we get a reprieve? I'm sure that's what happened to the likes of Gravesend & Northfleet and Maidstone? If they've fucked up, then surely they get the proverbial kick in the knackers and be booted out? Well, you would think that was the case. But for last years debacle with Chesterfield replaying their match against the Franchise. Now it seems the Sweet FA haven't a clue and have decided to replay the whole game again. Except it is at GGL and we get all the gate receipts from the first game. And Concord have to pay for there own travel expenses. And there is no replay if it is all square at full time. That's how you replay a match, thanks Sweet FA! 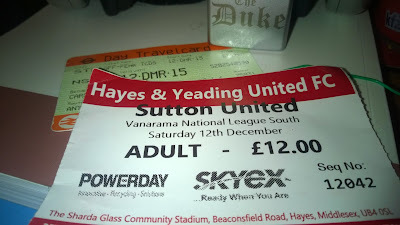 Back to the Hayes & Yeading game now, and the train to take us up to town was the 0911hrs from Carshalton. Meeting Taz outside and sampling a cup of Rosie from the splosh van, we made our way to the platform and awaited the arrival of the train. We also managed to have a little natter with British Rail's finest Liam, who was hoping to finish early and also make the trip to the game. The same old boats making the trip today were: Mr X, 4 Days, Sean & Indy. 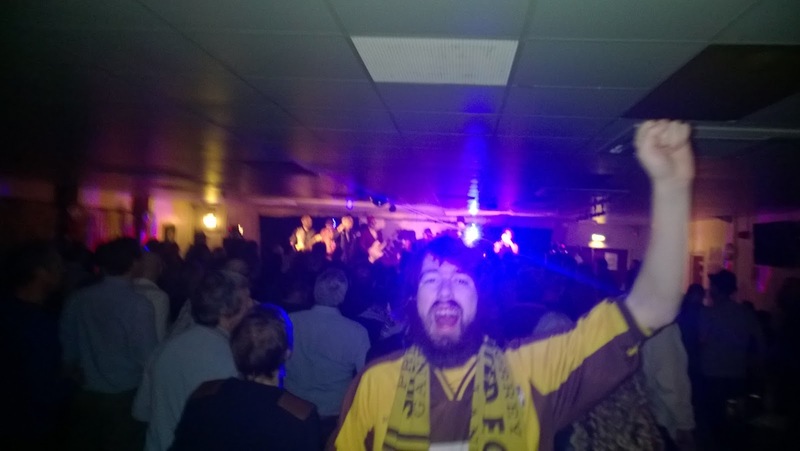 The trip up was mostly filled with talk of the FA Trophy nonsense and bacon rolls. Arriving at Farringdon, we shuffled over to the tube and towards Paddington. For the first time in ages we managed to get there with over twenty minutes to spare before our train. 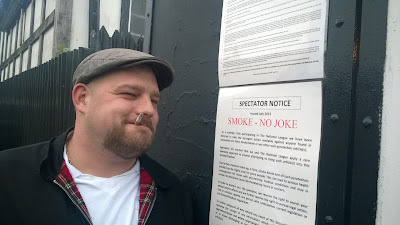 And whilst Taz managed to grab the tickets without any fuss, this gave me & Mr X plenty of time to have a couple of smokes. Oi! Stop smiling! It's no joke!!! With only three carriages (and no lights on) for the journey, the rattler was packed and there was to be no sitting down for most of us. So much for £7.55 on a return ticket! Just as we were about to leave we were also inundated with Carlisle supporters on their way to Oxford. Cue the usual gab of Coventry and the famous 1000 years save on Championship Football Manager which Taz has been examining. Just think, by the time we first see York Road from the train, it would be the closes we got to the place for the next four hours until we actually arrived at the turnstiles. First pub of the day was the posh 'Spoons at the other end of the high street. Surprisingly for the Firm it was a rather quiet affair with us only having a couple of pints in the time we were there. Most of the time was spent reminiscing of some of the old away trips that we've done over time. One day we here at Gandermonium might create a top 10. 'Best', 'Shittest', 'Heaviest' & 'Most Pointless' were but a few suggestions for categories. Second on the list was the 'Maiden's Head' and not long after that we were in the other 'Spoons. Some of the boys had food. 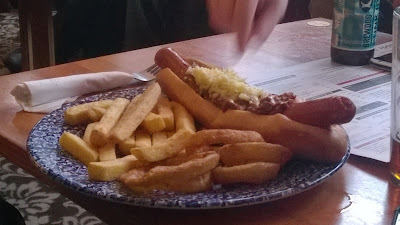 Taz in particular, after many deliberations sided for the biggest sausage this side of Soho. There was a moment when someone tried to sneak a piece off his plate (see below), but Taz can be quicker than a Samoan sprinter when he wants to be and fought off the attentions on his grub. Eventually after a couple more beers we did make the two minute walk down to the ground. 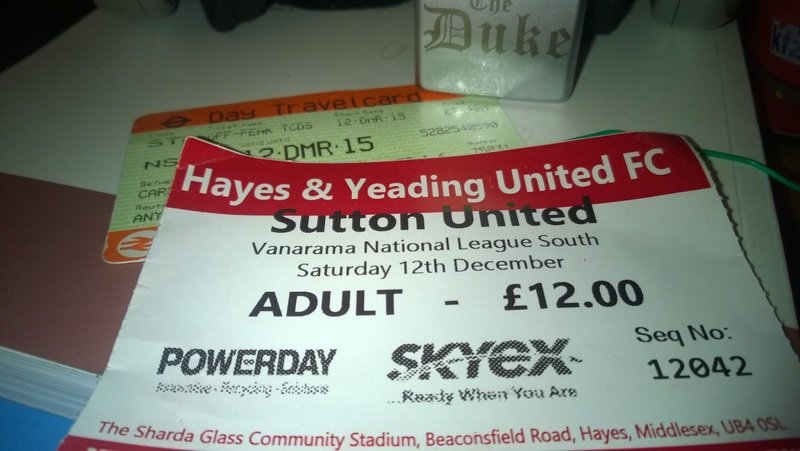 And for the first time, actually got a ticket that had Sutton United on it! Worner, Amankwaah, Wishart, Beckwith, Eastmond, Collins, Bolarinwa, Gomis, Dundas, Fitchett, Wright. Bench Warmers: Stearn, Fleetwood, Downer, John, Cooper. Keeping very much in the vein of our recent league games, Sutton started strong down the slope. Once again our passing game was looking decent on the slightly soft pitch. In particular, having Amankwaah & Bolarinwa coming down the right hand side, caused no end of problems. Also with no big man upfront, it was down to Fitchett to make the space. Before the quarter of hour was up we were in the lead. The Legend that is Dundas managed to control the ball in the middle of the park and spread it to Amankwaah. he then used his pace to run it down the wing and cross the ball. As it sailed into the box, it was met by an unmarked Fitchett & he glanced it back into the left side of the goal. 1-0! Ten minutes later Sutton had doubled their advantage. Once again Fitchett received the ball near the box and played it up for Bolarinwa. His shot was blocked by one defender (the other just seemed to slide tackle an invisible man) and for once the luck was with Sutton as the ball fell to Fitch who slotted it home. 2-0! Our momentum was to be checked a couple of minutes later when HandY got a soft goal back. Even though some would say that Worner was impeded as he tried to come to a looping header, but we shouldn't be in that position in the first place. The rest of the half saw Sutton holding their own and HandY trying to knock on the door without reply. The second half saw Sutton attack up the hill and trying to get that vital third goal. Most of the half saw both teams try and force the game to their advantage. HandY had several near chances that failed to produce the goods. Every time they surged forward, you could feel the tension behind the goal. That or someone needed the toilet. On the hour mark there were some changes made. First saw Gomis get replaced by Fleetwood. That change was understandable as this gave us another outlet on the wing to cause HandY some trouble. The other one I didn't quite understand at the time as Cooper was brought on for Wright. Still there was a possible penalty shout as Dundas was fouled in the box but as usual we got nothing from the man in the middle, who wasn't having a great day. Sutton finally got the third in the 77th minute. With Wishart on another free kick. we saw his effort spilled by the HandY keeper. Collins was the quickest to react and hit the ball home. 3-1! After Stearn was brought on for Bolarinwa, Fleetwood had the chance to put the cherry on top. I'm beginning to think he may never score as his hard work getting into a positive position was wasted with a shot a bit too close to the keeper. Sod taking on Lympstone's mob! After the match we celebrated by leaving straight away and heading to the 'Spoons. The question was, "Do we go to Madness?". Well, first of all was the little thing of a certain European Championship draw. Everything was going well with the draw when suddenly an almighty ruckus was heard from underneath the box. And what was causing the ruckus? Only 4 Days after seeing what group his beloved Taffy's had ended up in. While still deciding on our best course of action, I snuck out for a cheeky tab. Whilst outside all manner of weird nonsense started. 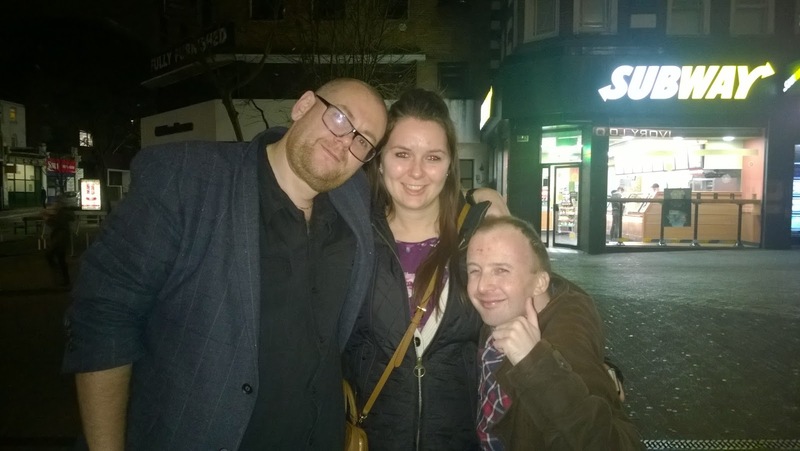 No, not the usual nonsense you get on a Saturday night in Sutton, but a very Maidenhead style thingy. With more people than a HandY match around, a procession of families walking past with Chinese lanterns & drums. 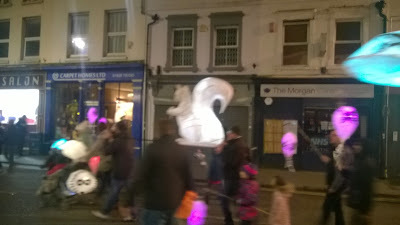 Out of nowhere came several people carrying a lit up Deer, then a Dragon and finally a Squirrel. I stubbed my cigarette out and walked back in after that, before I got fragged into this odd pagan procession. Big illuminated squirrel. Big Whoop. Wanna fight about it? With some supplies bagged for the train, we headed towards the station and awaited our rattler back to town. Once again there was no room to sit down and we were forced to stand until we got within the sights of sunny Slough. 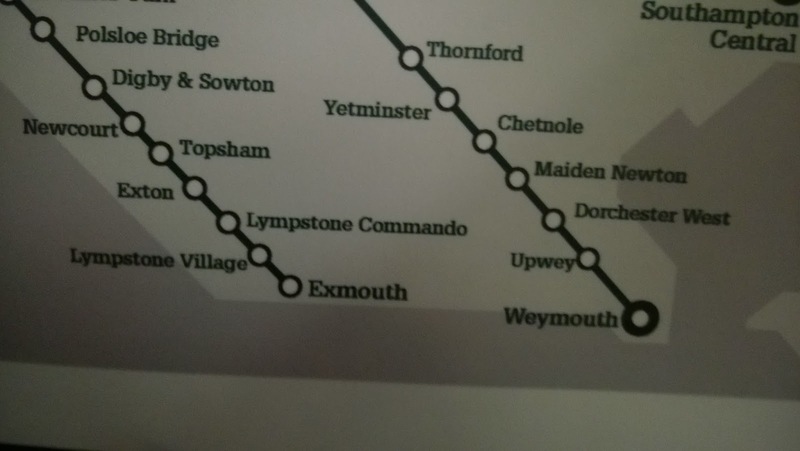 And I'm still none the wiser what Lympstone Commando station is all about. Taking a tube back to Farringdon we were soon awaiting the next link in our journey. The problem with drinking all day is that some of the older members of The Firm need to go the little boys room at the most inconvenient times. Namely four of us were standing crossed legs waiting for our train to arrive. In the end we got on the next train to pass through, just to use its facilities and then jumped back off at Blackfriars for the 2000hrs train we actually wanted, back to the club. Yes we went to Mainly Madness. At one point Taz tried to sneak off, but after a touch of the old blackmail he was soon with us. There was to be a few additions at this point. The Firm Leader had convinced his better half that popping out for a pint of milk would take several hours & involve him coming home stinking of booze, Wardy appeared having no recollection of the previous twelve hours. Finally it was Sutton's own Iain Dowie's (and yes Mr X, he did play for them) turn to arrive from a rather embarrassing defeat down the road at the hands of the Nigel's. "Yes! Wales drew England, I'm SO happy!" With many drinks sunk and songs sang to the limit of our musical ability, it was time to grace O'Neills. Mr X took this time to bow out and that left the usual suspects to prop up the back of the bar. As usual it was not without incident as whilst the Firm Leader was 'pointing Percy at the porcelain' his action was interrupted by three coppers steaming in and 'dealing' with an unsavoury incident in trap number one. So that's it for another journey. Turns out that we could be playing Curzon Ashton in the second round of the FA Trophy. If we beat Lowestoft before that. And only if we beat Concord before that. If we beat... No that's too many. Maidenhead at home before all that, and Juan is doing the blog we haven't yet decided who's on duty for that one yet, as Taz is off to Espana and I'm not sure I can be arsed. So it'll probably be me. PS. A little mention must go out to Chelsea Keith & Arsenal Natalie who had to put up with us outside as they were trying to get home. I promised them I would give them a mention! And as proof, here's a photo as well!